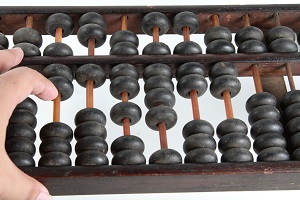 The abacus is the earliest known computer. I think it was invented by designers in China, Inc. and is still widely used. When I lived in Japan in the 1980s, I often marvelled at the speed with which so many shopkeepers could tally totals with this archaic computer. The design incorporates a simple GUI, but no identifiably cybernetic features. The cost/performance ratio is still one of the best in the industry.